How much traffic does a Wikipedia “Did You Know” attract? If you follow me on social media (Twitter, Facebook and so on) you may have seen me congratulate Dr. Karen Stollznow over the weekend. It was because her new Wikipedia biography (launched just before TAM) appeared on the main page of Wikipedia as part of the “Did You Know?” feature. This is a box on the left side of the page that pulls interesting trivia from articles recently added to Wikipedia. The main page of the English Wikipedia is apparently used by many as an entry point. It currently receives between 4 and 5 million page views every day. That’s a tremendous amount of traffic, and it guarantees that anything linked from that page is going attract alot of readers. Like the rest of Wikipedia, the Did You Know? feature is collaboratively edited. Anyone can nominate a page to appear there, as long as they follow certain rules. When I create a new article that is relevant to skepticism, I nominate it in the hopes that it will be displayed here one day. The goal is to get the attention of those 4 million people, and expose them to skepticism. But how effective is this? Fortunately, Wikipedia’s transparency allows us to examine the traffic numbers and answer that question. In this article I hope to show it is a very good way to get new people exposed to skeptic concepts. … that Robert S. Lancaster created the website StopSylvia.com because he found Sylvia Browne‘s claims of psychic knowledge about missing children to be “incredibly offensive”? Like all Did You Knows it only appeared on the front page for a few hours. So what good did that do? Well, let’s go find out. We can use the tool at stats.grok.se to examine the number of page views each of the four articles linked in the item got that day. 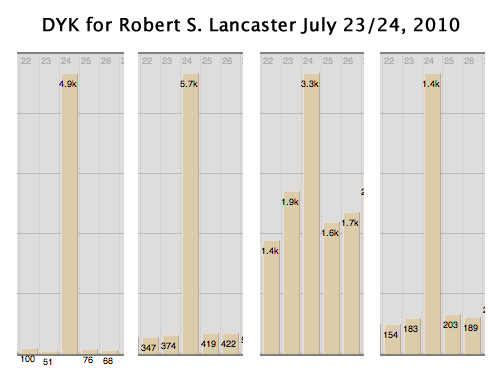 Using stats.grok.se I graphed the statistics for Robert S. Lancaster as well as the four other articles that appeared in his item: Sylvia Browne, Psychic and Missing Person. The image at right shows the day-to-day stats for the four articles, and the traffic spike for each is undeniable. Click to embiggen. (Note the spike is on July 24 in these graphs due to time zone issues: he appeared on the afternoon of July 23 in U.S. time zones, but most of the rest of the world was in July 24 at that time). We can conclude that around 4,800 people read about Robert who would not have otherwise. In addition, around 4,400 looked at Sylvia Browne, 1,400 at Psychic and 1,200 at Missing person who (based on the day-to-day statistics) would not have otherwise. That’s a significant bump for all those articles, anywhere from 7 times to 49 times the normal traffic level. But are these readers engaged? Are they interested in what they are reading? One way we might tell that is by looking at the stats for links within the article. If we see those articles spike too, a likely explanation is readers are digging deeper and learning more. That would be a good sign. As one might expect, there is a considerable drop-off from the 4,000-odd people who looked at the main article. But still, it is a significant exposure and does seem to indicate people are engaged in the content of the article and are interested in learning more. I’d like to point out that last link, the one to James Randi’s biography, which is also shown in the graph at right here. The only place that is linked in the original article is in a photo caption! More evidence that adding photos to articles helps, something I’m sure Susan Gerbic will appreciate. (She’s contributed tons of photos from skeptic events to Wikipedia). … that Karen Stollznow writes for two skeptical magazines (Skeptic and Skeptical Inquirer) and hosts two skeptical podcasts (Point of Inquiry and Monster Talk)? (Note: Monster Talk is not hyperlinked in the above because it did not have a Wikipedia article at the time this Did You Know was submitted). So let’s look at the statistics. Again we see a clear boost in page views for every one of the articles linked in the hook, except for “Podcasts” which shows no change at all. (Not too surprising, most people are familiar with what a podcast is in 2011). Excerpts from the graphs are below at right, click for a larger version. The actual numbers with links to the original graphs are below at left. Clearly this effort was not quite as successful as the first example. The numbers could have been affected by a number of factors such as time of day, the actual contents of the hook, what else was on the front page at the time, where the hook appears in the list and so on. (Few of these are under the submitter’s control, as a number of different editors participate in putting together the feature). I suspect the news stories were the biggest factor here, both Amy Winehouse’s death and the Oslo attacks were prominently featured on the Wikipedia main page at the same time. 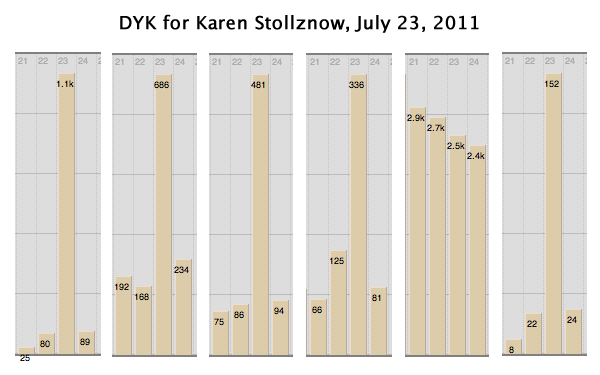 But there is still a clear benefit: over 1,000 people have read about Karen Stollznow’s work as a skeptic who would not otherwise have known about her, and hundreds of people clicked the other skeptic links that appeared with her. Clearly, getting new and expanded articles on skeptic topics listed in Did You Know is an excellent way to expose the general Wikipedia audience to material on skeptic topics. Articles appearing there get a boost in their traffic, and thus (sometimes huge) exposure. Further, secondary links in the DYK “hook” (the text on the main page) also receive a benefit, as do any links within the articles. Don’t forget to include in-article links to other skeptic articles as people do continue to browse. Because photos attract attention, links to other articles in photo captions are also very important. Note: There is currently a discussion amongst Wikipedia volunteers about what the contents of the main page should be in the future. I’m noticing quite a bit of negativity about the Did You Know feature from some editors. While the consensus as I write this still seems to be to keep this feature, it might be dropped eventually. I encourage you to make use of it for the purposes described here while it is still around. It might disappear and we will have to find other methods. This entry was posted in Metrics, Wikipedia on July 25, 2011 by Tim Farley. Awesome article Tim. You write so clear and detailed, when I grow up I want to be just like you.